Written by Janet Choi on August 31, 2017 . The energy was high at CloudApp’s Monday morning all-hands meeting. The sales team had closed a few large deals for the media and video sharing platform that week, and the entire company gathered to review revenue numbers. But they were surprised to see they hadn’t grown as much as they thought. Churn was dragging down their newly expanded revenue. That’s when Scott Smith, VP of Sales, realized he needed to shift his focus. “It was a freak-out moment,” Scott remembers. “We had been prioritizing growth with new customers and hadn’t been making sure to keep existing ones. This was a huge mistake. We quickly turned the Eye of Sauron onto churn and retention.” CloudApp, ready to shoot down churn Over-focusing on new customer growth is a common oversight. Addressing retention means that you’re not wasting all your hard work of attracting and acquiring people in the first place. Plus, your business growth gains momentum when you invest in what happens after signup. This is especially true for companies building subscription, SaaS, and other recurring engagement products that rely on customers coming back and continuing to find value. Your success is tied to the success of your customers. Keeping that alignment saves you from being swayed or distracted by vanity metrics or lopsided efforts. Digging deeper beyond logins, pageviews, and message opens is a customer-centric view of engagement, rooted in the very real-world question of whether your customers are making progress towards and accomplishing their goals. This is where data-driven retention communication comes in as an integral part of the customer experience — to reach out at the right moment to help make progress happen. Scott and the CloudApp team started to hone in on customer communication, revamping their email, in-app notifications, and other messages to help hit their target of 2% negative revenue churn. “What’s been the most interesting about this process,” Scott says, “is seeing how a few weeks or months of work focused on your current customers can help you grow faster than going out to find brand new ones.” These investments have paid off, and CloudApp now hits its revenue expansion targets consistently. Here’s how CloudApp uses data to automatically solicit feedback, unearth clues about customers’ needs, and learn how to improve their retention systems. It’s incredibly frustrating to hear that a customer churned because of a missing feature — that you offered all along. Julie McCollough, Head of Customer Success, was perusing responses to a data-triggered survey for current customers. One answer surprised her, as Scott explains: “There’s a company in New York called SeatGeek, and one of their key members told us they were happy with the product but would love it if we could do security authentication.” CloudApp already supported this authentication with OneLogin, which ensured the security of user content for organizations that wanted to keep private their shared photos, videos, and GIFs. Julie reached out to get SeatGeek set up with the feature, and all was well. closing the loop No news isn’t always good news. A customer who is quiet all year long may be happily plodding along, or they may be racking up small annoyances and dissatisfaction until they leave, and it’s too late to ask them what they need. Passive open-door approaches — the “You’re welcome to contact us at this support email address.” one-liner — are insufficient when it comes to surfacing issues. One customer service expert has found that only 4% of dissatisfied customers voice complaints to businesses, and support emails tend to focus on immediate troubleshooting. So when you consider your (many) quieter customers, then you have plenty of “under-the-surface” feedback to explore, with deep implications for your marketing and product experiences. CloudApp proactively solicits feedback from customers to avoid that fatal silence. They don’t just send a blanket-style survey to their entire user base once a year. Instead, they set up data-powered surveys that are automatically triggered to a subset of users when they perform certain actions or hit retention-related milestones in their lifecycle. This makes the feedback more timely and meaningful. Let’s look at two examples of automated retention campaigns CloudApp sends via Customer.io that have shown high customer engagement results. The Sticker Campaign: What do new users need? What brought you to CloudApp? What problem were you looking to solve? Anything we could be doing better? Any feature/product we are missing? And that’s how Scott’s team began collecting valuable feedback from their most engaged new users who had completed all key actions in the onboarding process. They receive around 500 survey responses per month, with the email boasting a 76% open rate and 37% click-through rate. A Zapier workflow sends the responses that have text in the 4th and 5th fields into productboard. Then the engineering, product, and customer success teams review the sticker feedback every two weeks. Julie consolidates the sticker responses and looks for prospective high-value users, so they can reach out to them directly and help them with what they need. The engineering team uses productboard to bucket and rank feature requests by priority of user cohorts and by how a feature fits into their broader vision for CloudApp. “It’s basically a more useful version of NPS,” Scott comments. “We’ll often see a trend about a certain feature that has existed for a while, but we previously were unaware that it was not being used as expected. These additional data points, collected in aggregate, give us a better sense that something isn’t working for a larger group of our users.” Based on what they learn from previously unspoken customer feedback, they can make adjustments to their marketing messaging, customer success documentation, and product to improve the experience for future users. 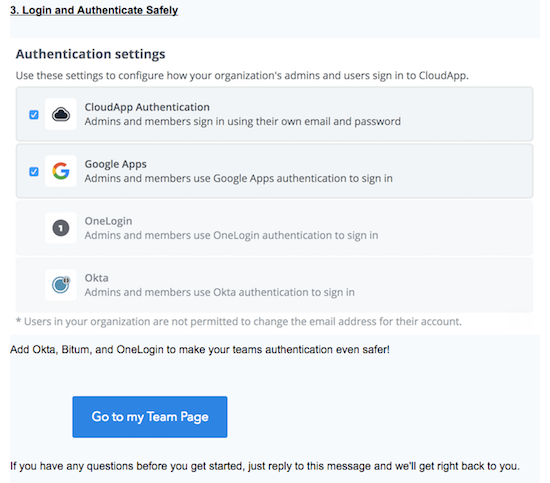 For example, CloudApp’s onboarding emails for teams currently show off their security feature so new customers don’t miss it. 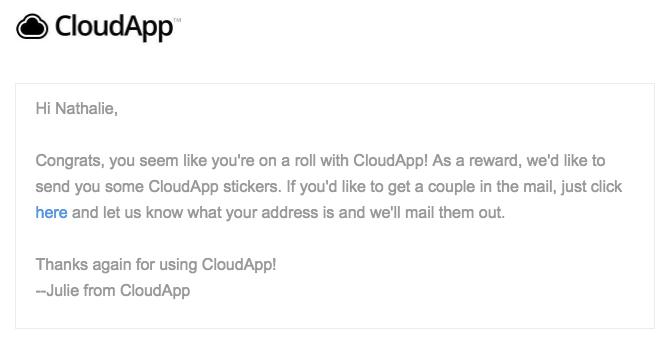 excerpt from onboarding email CloudApp’s Sticker Campaign opens a line of communication at a key time in customer onboarding — and makes it fun. Customers love it. Sure, mailing stickers and handwritten notes is labor-intensive. But thanks to data, CloudApp can offer this to just the right slice of users at the right moment. “It’s probably less than a dollar per user. If we get a tweet, email, feature request, or someone excitedly sharing their experience with their team at work, it’s great for us,” says Scott. Give / Get: What can we do to keep you from churning? Customer behavior signals important messages all the time, like “I need help!” or “I love your app!” or “Meh” or “I don’t know how to do more advanced things!” You can respond accordingly. Did they complete all those key activation tasks and invite four of their coworkers? That’s a good sign that they’re going to be a power user, and maybe they’re ready to upgrade to a paid subscription faster than the norm. Exporting all their data or haven’t been active in weeks? That’s a good sign that they’re on their way out, and you can preemptively reach out and work with that customer to get them happy again, all before they hit “cancel.” It’s important to catch those warning signs and automatically act on them, because when a customer stops logging into your app, that means trouble. A study of one million SaaS users showed that nearly all churned accounts were preceded by a period of non-use. 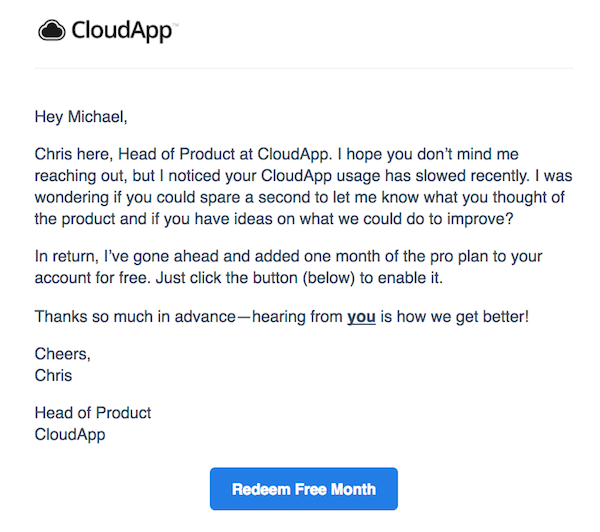 CloudApp combats this with their “Give / Get” email campaign, which triggers when users haven’t used the product for 30 days. The email comes from Chris, their Head of Product, who asks for some feedback: “I was wondering if you could spare a second to let me know what you thought of the product and if you have ideas on what we could do to improve?” And then comes the offer: “In return, I’ve gone ahead and added one month of the pro plan to your account for free.” A bright blue button entices the user to click back into the product and redeem their free month. This campaign, delivered at the right time with a catchy incentive, is very effective in bringing people back to the product. “We’ve seen about a 45% open rate on this email, a 3.4% click-through, and a 37% conversion-to-activity rate — that is, a user started using the product again and created a piece of content with CloudApp,” Scott reports. Retention and churn are often discussed in the same breath. But churn itself is a symptom, rather than the root problem you’re solving for. Churn prevention and the overall work of retention starts way at the beginning, by building healthy habits that benefit the customer rather than just treating the symptoms and throwing out a lifesaver at the very last minute. When you invest in your customers’ success from the minute they sign up for your product, nurturing them even after they’ve handed over their credit card once or twice, you’re investing in the success of your own business. Happy customers stick around for longer – so that’s the key: create happy customers by actually helping them accomplish the goals that motivated them to come to your product in the first place. That’s always going to be welcome in a user’s inbox, and that’s what will get them to stick around. A version of this post originally appeared in Chapter 1 of Clearbit’s Data-Driven Marketing Book. Check out the full piece for more insights and a breakdown of top-performing retention emails at CloudApp, AdRoll, and CoSchedule.